Sony has announced 3 new DSLR cameras today and among them we find an exciting Full Frame model that suits photographers that are on a budget, but want Full Frame quality. The A850 feature 24.6 megapixels and a high quality 3″ LCD screen with 921k resolution. It is pretty similar to its big brother A900, but have a bit smaller viewfinder and slower continous shooting. It is nice to see that Sony brings us cameras that lower the prices for Full Frame DSLR cameras. 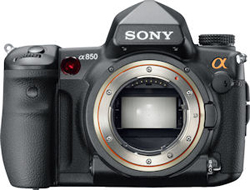 The Sony Alpha DSLR-A850 will be on the marked in September 2009 and cost about €1999. SAN DIEGO, August 27, 2009 — Aimed at experienced shooters looking for value and sophisticated SLR performance, Sony today introduced the full-frame α850 camera and a new 28-75mm F2.8 lens. The α850 camera is designed to deliver ultra-fine picture quality with a high resolution, 24.6-megapixel, 35-mm full-frame Exmor™ CMOS sensor and fast image processing with dual BIONZ™ processing engines. It also offers high-speed continuous shooting of 24.6 megapixel images at up to three frames per second. The camera’s Exmor CMOS sensor delivers the photographic expressive power of wide angles and perspective that only a 35 mm full-frame sensor can offer, and is designed to take advantage of the resolving power of high-precision alpha lenses. Its high pixel count and large size provide enhanced image detail and a wider dynamic range for natural color reproduction and subtle tonal gradations. Image processing gets a boost in speed and power from two BIONZ processing engines. Large amounts of data captured by the 24.6-megapixel sensor can be quickly processed to achieve a fast shooting response. Additionally, this dual BIONZ system applies advanced noise reduction algorithms producing images of exceptional quality and detail, especially at high ISO sensitivities. The camera’s innovative intelligent preview function takes the guesswork out of setting up a shot and the hassle of taking multiple shots to achieve a desired effect. After pressing the depth of field preview button, the camera “grabs” a RAW preview image which is processed and displayed on the LCD screen. You can then fine tune white balance, determine the best level and effect of dynamic range optimization, adjust exposure compensation and check histogram data, all before you actually take the picture. Preview images are not recorded on the camera’s memory card, thus saving capacity. The camera’s autofocus system features nine sensors with 10 assist points for improved tracking of moving subjects. A center dual cross sensor comprised of two horizontal and two vertical line sensors as well as a dedicated f/2.8 sensor are included to achieve greater precision, especially when using fast-aperture lenses. The ultra-bright viewfinder with 98 percent field of view coverage and 0.74x magnification enables accurate framing and preview. It features a high-power condenser lens, an eyepiece with high reflective-index glass, and a multi-layer, anti-reflective coating on optical surfaces to deliver its extraordinarily bright view. A mirror box features a parallel-link mirror mechanism that moves on two horizontal axes to accommodate both the large full frame mirror and the body-integrated image stabilization system without increasing the camera’s size. With its body-integrated SteadyShot INSIDE™ image stabilization, the camera achieves an anti-shake effect equivalent to shutter speeds faster by 2.5 to 4 stops. The anti-shake system stabilizes all Sony, Minolta and Konica-Minolta compatible lenses even wide angle or large aperture lenses. Other key features aimed to expand creative options include the Dynamic Range Optimizer (DRO) with five levels of user-selectable correction as well as DRO bracketing for enhanced scene analysis and graduation optimization. EV bracketing with ±2EV range makes it easy to create high dynamic range composite images. With the camera’s HDMI™ output and Photo TV HD mode, your creative output can be enjoyed on a compatible HD television. This mode brings the look of actual printed photography to the television, by fine-tuning such image parameters as sharpness, gradation, and color reproduction. The a850 model features a 3-inch (diagonally), Xtra Fine LCD™ screen (921K) making it possible to check focus and image quality with accuracy. It incorporates an easy-to-see display with a quick navigation menu to easily access common functions without interrupting your creative flow. A backlit LCD panel sits on top of the camera and displays key settings. The camera includes dedicated slots for high-capacity Memory Stick PRO Duo™, Memory Stick PRO-HG Duo™, HX series and CompactFlash® media. The choice of full-frame lenses to complement the α850 model is enhanced with the new SAL2875 28-75mm F2.8 SAM lens. This compact, easy-to-carry lens is ideal for photo enthusiasts looking to add a bright, general purpose zoom to their collection of full-frame optics. Delivering excellent imaging quality at an accessible price, it offers a wide F2.8 aperture over its entire zoom range. Ideal for day-to-day shooting tasks, its bright constant aperture makes the 28-75mm F2.8 SAM particularly valuable for depth-of-field control and available-light portraits. The a850 (model DSLR-A850) will be available in September for about $2,000 (body only) along with related accessories. All a900 accessories are compatible with the a850 camera, including the dedicated vertical grip (model VG-C90AM). The SAL2875 lens will be available in November for about $800. All will be available at authorized dealers, at military base exchanges, Sony Style retail stores (www.sonystyle.com/retail) and at sonystyle.com.